The flat "paddle" shape appearance, along with square corners, makes it an ideal choice for use with popular hinge series such as Geneva, Vienna, and Cardiff. Stocked in seven popular finishes, the Paddle Knob requires glass fabrication. Solid brass Crescent Grip Cylinder Style knobs. Cylindrical shape is functional with a firm grip without detracting from the beauty of an all glass door. Overall diameter of knob is 1", overall height is 1.15" from glass. Solid brass Traditional Style knobs are available in over 20 finishes. 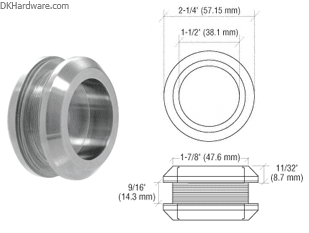 Overall diameter of knob is 1-9/16", overall height is 1" from glass. End cap for single sided knobs stands 1/4" from the door surface. The solid brass Square Style Knob is a favorite of architects, designers, and homeowners who wish to match the square cornered construction of such popular CRL Hinges as the Geneva, Vienna, Concord, Cardiff, and Junior Geneva Series. The ribbed appearance will add to the appeal and create a beautifully aesthetic appearance. The Square Style Knob measures 1-3/16" across and stands 1-3/16" from the surface of the glass. Stocked in five popular stock finishes, Brass, Chrome, Brushed Nickel and Oil Rubbed Bronze. 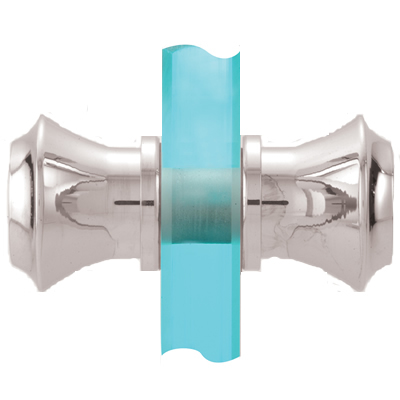 Larger size of this knobs allows for easy gripping on shower or glass entry doors. Overall diameter of knob is 1-3/4", overall height is 1-5/16" from glass. Can be used as door knob or a wardrobe hook on a glass panel mirror. Crystal knobs are clean and transparent. 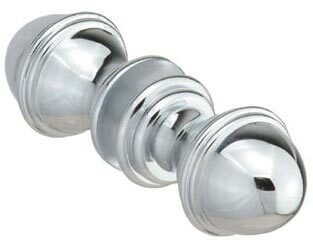 Solid brass Bowtie Style knobs are eye catching in appearance on frameless doors. Overall diameter of knob is 1-3/4", overall height is 1.5" from glass providing a sturdy grip. 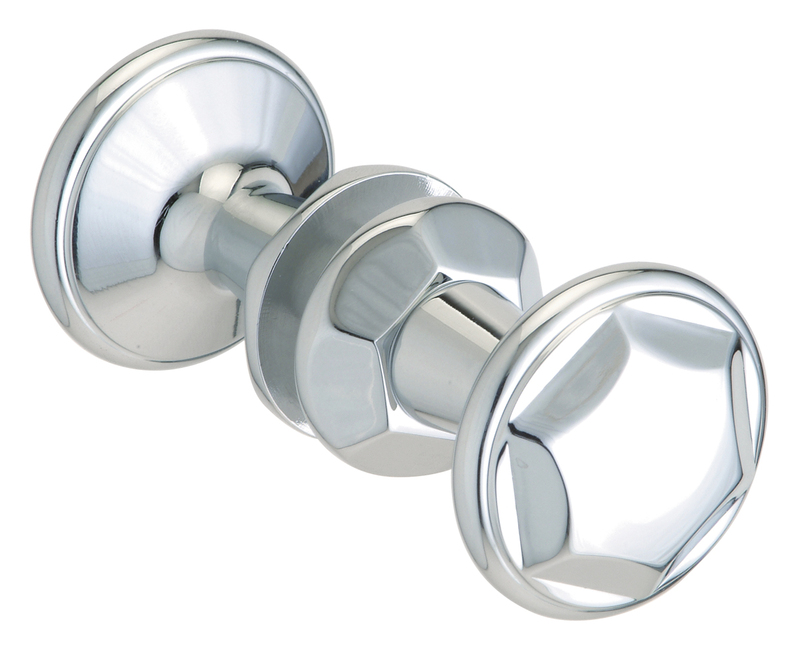 Solid brass Ball Style knobs are eye catching and functional in appearance on frameless doors. 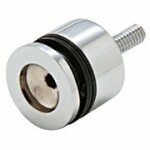 Overall diameter of knob is 1-1/4", overall height is 1.5" from glass providing a sturdy grip. Solid brass Flair Style knobs are eye catching in appearance on frameless doors. Overall diameter of knob is 1-3/16", overall height is 1.1/16" from glass providing a sturdy grip. 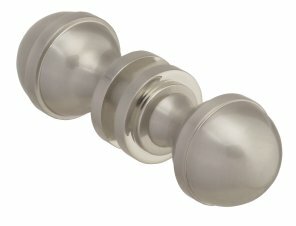 Solid brass Ribbed Bowtie Style knobs allow good grip and are eye catching in appearance on frameless doors. 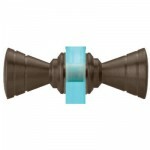 Overall diameter of knob is 1-3/8", overall height is 1-9/16" from glass providing a sturdy grip. Solid brass simply elegant Cylinder Style knobs. Cylindrical shape is functional without detracting from the beauty of an all glass door. The Plastic Sleeve Model is ideal for use on sliding bypass shower doors. Overall diameter of knob is 3/4", overall height is 1.25" from glass. The NEW CRL Finger Pull Knob is ideal for use with CRL Bypass Sliding Shower Door Systems. They allow for easy opening of the doors from inside the shower enclosure. The 1/4-20 threading of the Finger Pull Knob makes it compatible with most other CRL Towel Bars and Knobs, including our BMNW Series. The Laguna Series Thru-Glass Pull has a recessed low profile design that you screw together to install. Its solid stainless steel construction makes this a rugged yet elegant solution for a pull handle. The thickness of this Thru-Glass Pull Handle doesn't impede movement in front of walls or glass sidelites as it allows for full door opening access. 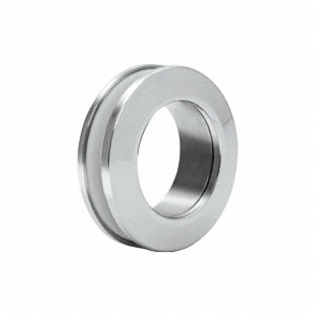 Supplied with clear gaskets to accommodate door glass from 3/8" to 1/2" (10 to 12 mm) thick. Its solid stainless steel construction makes this a rugged yet elegant solution for a pull handle. The thickness of this Thru-Glass Pull Handle doesn't impede movement in front of walls or glass sidelites as it allows for full door opening access. The CRL Square Single-Sided Knob is ideal for use with our SQ Series Towel Bars to adapt them into Towel Bar/Knob Combinations. 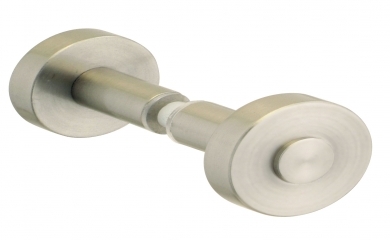 The Knob comes with a 1/4-20 threaded screw that fits most CRL Towel Bars. Knob measures 3/4" x 3/4" x 1-3/16" (19 x 19 x 30 mm). Stocked in six popular finishes. Colors shown are for reference purposes only. Exact matches are not possible with your monitor display. 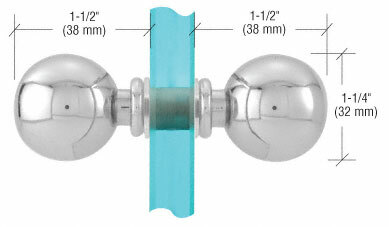 Hardware styles for door, inline and corner showers.